Book reviews and information on dinosaur books by Everything Dinosaur team members. The official press release to accompany the recently published “The Dinosaurs Rediscovered” by Professor Michael Benton (University of Bristol), states that we are “living in a golden age of dinosaur science“. With so many new dinosaurs being named and described, the last one we blogged about was the small, Australian Ornithischian dinosaur Galleonosaurus dorisae, named just a few weeks ago, it is hard to disagree. The jacket cover of the new book about dinosaurs “The Dinosaurs Rediscovered”. The official press release states that over the past twenty years, the study of dinosaurs has changed from natural history to a true scientific discipline. The utilisation of advanced technologies has revolutionised the study of prehistoric animals and life in the past. This book, written by eminent palaeontologist Professor Mike Benton, combines first-hand accounts and anecdotes from a lifetime of fossil collecting with an updated review of Dinosauria research. The press release goes on to state that “The Dinosaurs Rediscovered” presents all the latest palaeontological evidence which has transformed the study of dinosaurs. Team members were asked the other day to select our favourite chapter. This was not an easy task as all the chapters are beautifully compiled, but when pressed, we opted for chapter 9. Chapter 9 outlines the reasons for the mass extinction event and explains in terms that the general reader can easily follow, the research into the Chicxulub impact crater. This chapter also informs the reader that the extra-terrestrial bolide crashed into Earth probably in June – how can scientists make such an assertion; we suggest you read the book to find out! Published by: Thames & Hudson. Spring is in the air, the frogspawn in our office pond has turned from black dots to commas and with the arrival of British Summer Time (BST), the days seem longer. The next issue of “Prehistoric Times” magazine must be coming out soon and sure enough we received an email from the editor informing us that issue 129 (spring 2019), is at the printers. This issue will commemorate the publication of one of the most important and influential papers on the Dinosauria ever produced. It is fifty years since John Ostrom’s seminal paper on Deinonychus antirrhopus appeared in the scientific literature. Prehistoric Times magazine (issue 129). Inside the magazine, the excellent and most informative Phil Hore will discuss the anniversary of the ground-breaking paper. Ostrom’s paper entitled “Osteology of Deinonychus antirrhopus, an unusual Theropod from the Lower Cretaceous of Montana”, was published in the Bulletin of the Peabody Museum of Natural History in July 1969. The entire paper can be downloaded (all 165 plus pages), as a pdf from the Museum’s archive. It was this paper that defined Deinonychus as a fast-moving, agile predator and that demonstrated that birds evolved from members of the Dinosauria. The 1969 paper features an illustration of Deinonychus, one that helped to redefine the way academics and the public view dinosaurs. It was regarded as a “dinosaur renaissance”. The original “Dinosaur Renaissance” inspired by Bakker (Deinonychus). The spring issue of “Prehistoric Times” includes an article on the enigmatic chalicotheres and it features the illustrations of the British artist and author Dougal Dixon. The head of Edgar Rice Burroughs Inc, from Tarzana, California, writes an informative piece about Burroughs and the book that inspired numerous writers “The Land That Time Forgot”. Philip J Currie returns for the second part of his feature on the dinosaurs of “The Land That Time Forgot” and Stephen Brusatte provides a review of the top palaeontology related news stories of the last twelve months. The front cover of the magazine with its splendid Deinonychus artwork is certainly very eye-catching, as it that fuscia-coloured font. We are looking forward to receiving our copy of “Prehistoric Times”, it should be with us very soon. Everything Dinosaur has received an uncorrected proof of the eagerly awaited new dinosaur book by Professor Michael Benton. Team members are looking forward to reading about how research into the Dinosauria has been revolutionised over the last two decades or so. Professor Benton is one of the leading lights in vertebrate palaeontology and has written over fifty books covering a wide range of prehistoric animals and events from deep time. As the head of the world-renowned Palaeobiology Research Group at the University of Bristol, Professor Benton has been involved in and led some of the most insightful and ground-breaking studies into the dinosaurs, helping to re-write scientific understanding. “The Dinosaurs Rediscovered” by Professor Mike Benton. The book runs to 336 pages with 163 illustrations (23 in colour), it explores the changing story of the dinosaurs, highlighting how the application of 21st Century technologies have revealed new information about these remarkable reptiles, information that had been locked deep inside their fossilised bones and teeth. Trace fossils are also explored in detail and Professor Benton demonstrates how biomechanical engineering combines with computer modelling and digital dinosaurs to calculate how fast Theropod dinosaurs could run. The work of the famous Bristol Dinosaur Project is covered and naturally, Bristol’s very own dinosaur Thecodontosaurus (T. antiquus) is included, but Professor Benton does not just feature dinosaurs from the south-west of England, this impressive publication provides a global perspective on the Dinosauria. This beautifully written book includes chapters on feathered dinosaurs and even explores whether dinosaur DNA could be used to resurrect the Dinosauria. An illustration of the feathered dinosaur, about to become stuck in amber. Professor Mike Benton introduces the reader to some amazing recent dinosaur discoveries. This is an engaging account of the evolution of the “terrible lizards” and is aimed at readers with a general interest in life in the past as well as academics and students. Fans of prehistoric animals and dinosaur devotees don’t have to wait too long before this book is published. The hardback is due out on April 25th (published by Thames and Hudson). 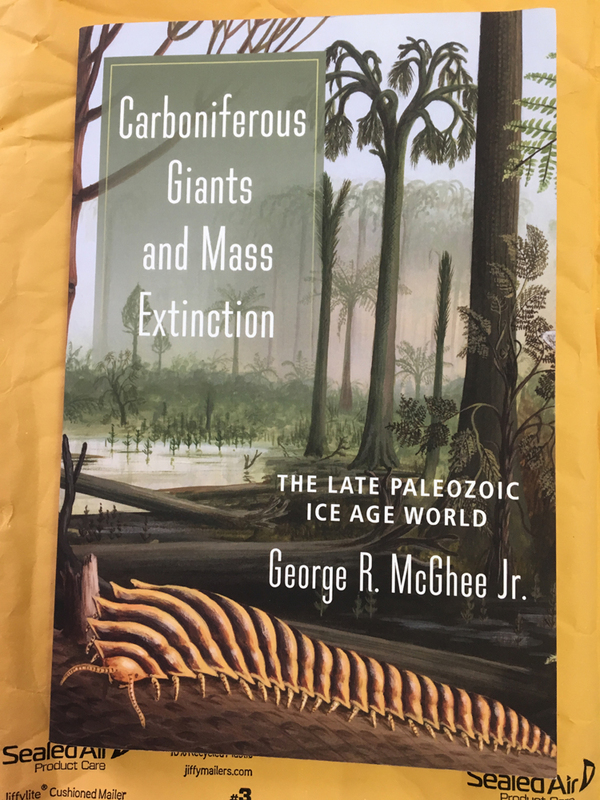 Long journeys and hours waiting around in train stations and airport terminals have been made bearable thanks to an excellent book written by George R. McGhee Junior, a Distinguished Professor of Palaeobiology at Rutgers University. The book is “Carboniferous Giants and Mass Extinction”. At this time of year, Everything Dinosaur team members seem to have to undertake a lot of travelling, what with their project work and teaching commitments, this eminently informative and enjoyable book has proved a worthy travelling companion. “Carboniferous Giants and Mass Extinction” an excellent book that explains the science behind our knowledge of the Carboniferous flora and fauna and explores the impact of the End-Permian mass extinction event. One of the ironies of having read this book from cover to cover is that we have only just noticed that the front cover artwork showing a typical Late Carboniferous rainforest dominated by lycophyte scale trees, giant horsetails such as Calamites and marattialean tree ferns, was produced by our dear friend Richard Bizley. Richard is a highly respected artist, he produces exquisite prehistoric scenes as well as landscapes and science fiction illustrations. The huge millipede in the foreground is Arthropleura armata, which is estimated to have grown in excess of three metres long. This giant arthropod is illustrated inside the book too, Mary Persis Williams, another highly respected scientific illustrator, shows the scale of A. armata by comparing it to an extant American Alligator (A. mississippiensis). Life on Earth in the Carboniferous and Permian was very different from ecosystems today. As well as the giant arthropods found in terrestrial and marine environments, there were alien-looking plants and bizarre vertebrates some of which (synapsids), were the distant ancestors of mammals. Top predators in the Carboniferous forests and Early Permian swamps included salamander-like amphibian batrachomorphs such as the monstrous Eryops megacephalus, which grew to more than two metres in length and was capable of swallowing a small child whole (if humans had lived in the Palaeozoic). A scale drawing of Eryops. The latest edition of “Prehistoric Times”, the quarterly magazine for fans of dinosaurs and prehistoric animal figures has arrived at Everything Dinosaur. Issue 128 is jam-packed with features, articles and stories, there’s even a summary of recent dinosaur fossil discoveries and research. This provides an opportunity to catch up with Saltriovenator, Tratayenia and Crittendenceratops – all new species of dinosaur. In the winter 2018 edition, the focus is on celebrating the 100th anniversary of the trilogy of prehistoric animal themed novels by the acclaimed American author Edgar Rice Burroughs (The Caspak Trilogy). The front cover of “Prehistoric Times” magazine issue 128 (winter 2019), marks the 100th anniversary of the book “The Land that Time Forgot”. The three titles “The Land that Time Forgot”, “The People that Time Forgot” and “Out of Time’s Abyss”, collectively referred to as the Caspak Trilogy, after the prehistoric island where much of the action was set, are celebrated in the magazine. Lots of readers have provided illustrations and artwork to celebrate the centenary. The front cover artwork was created by Joshua Ballze and Phil Hore’s excellent article includes numerous illustrations, of which, for us, the contributions of Mike Landry really stand out. Renowned Canadian palaeontologist, Phil Currie provides a perspective on the prehistoric animals within the novels and Allen Debus continues the science-fiction author theme with an article that compares and contrasts the work of Jules Verne and H. G. Wells. It might be cold and dark outside, but readers are transported to the high Atlas mountains of Morocco in a well-penned feature by Sergio Luis Fica Biston that showcases the stunning Trilobite fossils that can be found in the ancient rocks that surround the small town of Elnif. Finding the fossil is the start of a painstaking and long process of fossil preparation. Some individual specimens can take upwards of thirty hours to prepare before they are ready to be put on display. A beautifully prepared Trilobite specimen from Morocco. Tracy Lee Ford discusses the anatomy of Triceratops and provides a guide to scientific illustration. Torosaurus is covered too, along with a helpful illustration of the fused cervical vertebrae, a characteristic shared by all Ceratopsians and an explanation of the differences between the hand (manus) and feet (pes) of these horned dinosaurs. The article concludes with an updated life restoration of “three horned face”. Cress Kearny introduces part two of the article demonstrating the beauty and wonder of agatised dinosaur bones and stamp collecting fans have the chance to brush-up on their prehistoric animal themed stamp knowledge with a well-crafted feature on dinosaur stamps of the 1970’s. Issue 128 also includes part eleven of the comprehensive overview of the work of the Czech illustrator Zdeněk Burian by John Lavas. In the previous issue of “Prehistoric Times” how the Plesiosauria were portrayed was covered, this edition focuses on the Mosasauridae. Dramatic scene from the Western Interior Seaway painted by Burian. Purchasers of the magazine will also have the chance to see pictures of new prehistoric animal model releases as well as to read an article all about Sabre-toothed cats including the Nimravidae by John Tuttle and there are lots and lots of reader submitted artworks to admire. Prehistoric Times Issue 128 Is Coming! The next edition of the quarterly magazine for dinosaur fans and prehistoric animal model collectors “Prehistoric Times”, is due to arrive very soon. Issue 128 (winter 2019), celebrates the 100th anniversary of the Edgar Rice Burroughs novel “The Land that Time Forgot”, hence the intriguing front cover where a tyrannosaurid is in combat with a Woolly Mammoth. Mammoths and members of the Tyrannosauridae family have featured on the front cover of this popular magazine before, but we can’t remember an edition of “Prehistoric Times”, where these two iconic but temporally distant creatures have appeared on the cover together. The front cover of “Prehistoric Times” magazine issue 128 (winter 2019. American author Edgar Rice Burroughs, set the story at the height of World War I. A ship carrying the main protagonist of the book, Bowen Tyler, is sunk by a German U-boat U-33, the submarine also attacks the British vessel that attempts to pick up survivors of the first attack. A fierce struggle takes place between the British sailors and the German submariners and the U-boat is captured. The survivors board the submarine and attempt to take it to an Allied port, but this proves too dangerous as all Allied shipping treats the U-boat as a potential target. Meanwhile, a saboteur disrupts the navigation and the vessel ends up in Antarctic waters. Low on food and fuel, the submariners find a huge island, surrounded by gigantic cliffs and when this landmass is explored, the German and Allied sailors discover it is populated by a pot-pourri of prehistoric animals. The plot may sound familiar, as the story has featured in many publications, since its first inception a hundred years ago. In the mid 1970’s a film with the same title as the novel came out with American actor Doug McClure playing the lead role of Bowen Tyler. The forthcoming edition of “Prehistoric Times” will feature a profile of one of the most famous dinosaurs of all, “three-horned face” – Triceratops. There is the latest instalment in the long running feature on the influential artwork of the Czech artist Zdeněk Burian by John Lavas, this time it is the Mosasauridae that are put into the spotlight. One of the most successful types of arthropod in evolutionary history, the Trilobita are given top billing. Team members are looking forward to reading more about this biostratigraphically important Class. Last but not least, Professor Phil Currie is interviewed. This internationally renowned palaeontologist needs no introduction. Professor Currie’s scientific accomplishments have led to a greater understanding of dinosaurs and their historic significance and he was instrumental in helping to set up with the University of Alberta the first free-to-access on-line course on the Dinosauria – Dino 101. Triceratops, palaeontologist Phil Currie and the Trilobita all feature in issue 128 of “Prehistoric Times”. At a conference in a rather chilly Helsinki held seventeen years ago this week, delegates of the World Heritage Committee of the United Nations Educational, Scientific and Cultural Organisation (UNESCO), confirmed that World Heritage Site status would be conferred upon a 95-mile stretch of the coastline of southern England covering the east Devon and Dorset coast. However, this description does not convey the true majesty of this location, nor does it provide a sense of awe that this part of the British Isles inspires in so many people. Neither does it do justice to the simple pleasure of finding a fossil, gazing at it and realising that you are the first living creature in 180 million years to set eyes upon the petrified remains of what was once another inhabitant of our planet. Then a book is published, a book that provides a sense of the stunning natural landscape, a book that transports the reader back in time, a book that conveys the sense of excitement and achievement associated with fossil collecting – “A Guide to Fossil Collecting on the West Dorset Coast” – does all this and more. A beautifully illustrated guide to fossil hunting on the West Dorset coast. RRP of £18.95 – highly recommended. Authors Craig Chivers and Steve Snowball focus on one part of the “Jurassic Coast”, that beautiful coastline that runs east from Lyme Regis to the foreboding cliffs of Burton Bradstock. First the scene is set. There is a brief description of the geological setting and an outline of the contribution to science of arguably Dorset’s most famous former resident, Mary Anning, and then the reader is taken in Mary’s footsteps through a series of guided walks travelling eastwards along the coast and forwards in time to explore the geology and remarkable fossil heritage of this unique sequence of sedimentary strata. A Lower Jurassic ammonite (Becheiceras gallicum) from the Green Ammonite Member (Seatown, Dorset). Drawing on their detailed knowledge of fossil collecting, Craig and Steve describe what to look for and where to find an array of fossil specimens along this part of the “Jurassic Coast”. The landscape is vividly portrayed and the book provides a handy, rucksack-sized reference for fossil collectors, whether seasoned professionals or first time visitors to Dorset. We commend the authors for including copious amounts of helpful information on responsible fossil collecting and for publishing in full the West Dorset Fossil Collecting Code. Golden Cap – excursions around Seatown. Majestic views of the “Jurassic Coast”. Talented palaeoartist Andreas Kurpisz provides readers with digital reconstructions of ancient environments and brings to life the fossil specimens, showing them as living creatures interacting with other prehistoric animals in a series of Jurassic landscapes and seascapes. These reconstructions help to document the changing environments that are now preserved within the imposing cliffs of this remarkable part of the British coastline. The book contains stunning photographs of fossils from the “Jurassic Coast”. Autumn is very much with us, the long summer seems a distant memory already. Our chums across the Atlantic refer to this season of mellow fruitfulness as the Fall, so time to review the latest copy of “Prehistoric Times” magazine, issue 127 (autumn/fall). This issue of the quarterly magazine features “Prince Lizard” – Rajasaurus, on the front cover, the illustration has been created by renowned palaeoartist J. A. Chirinos. Prehistoric Times issue 127 (autumn 2018). Mike Fredericks has included a summary of his recent YouTube interview with Steve Alten, the author of the book “Meg”, upon which the summer blockbuster movie of the same name starring Jason Statham was based. The interview script is accompanied with some amazing illustrations featuring the giant prehistoric shark but look out for a marine reptile too. On the subject of marine reptiles, New Zealander John Lavas discusses the artwork of Zdeněk Burian that portrays plesiosaurs and pliosaurs, as he continues his comprehensive overview of the work of the influential Czech artist and illustrator. An illustration of the mid-Jurassic pliosaurid Peloneustes by Burian. The debate as to whether dinosaurs had lips is discussed at length in a most informative article written by Gregory S. Paul, we wait to see whether future editions of “Prehistoric Times” will include the counter argument, perhaps Tracy Lee Ford, a regular contributor, can provide a summary of the evidence that contradicts this hypothesis. For the time being, the aforementioned Tracy Lee Ford focuses on the skull of Triceratops in his regular feature “How to Draw Dinosaurs”. This article is part one of a two part series, in the winter edition, the emphasis will be on drawing the body of this famous horned dinosaur. Jordan Mallon of the Canadian Museum of Nature continues the horned dinosaur theme with an article on the safe removal of a Chasmosaurus skull from a dig site located near the South Saskatchewan River in Alberta. As well as contributions from leading scientists, this magazine provides a platform for dinosaur fans to showcase their artwork. A highlight for us was reading about the Rajasaurus inspired artwork produced by students at Brandywine Heights High School in Pennsylvania. Look out also for the superb Leptoceratops painting supplied by Mohamad Haghani and Mike Landry’s beautiful Platybelodon artwork that is included in Phil Hore’s article on the “shovel tuskers”. Jack Wilkin writes about Allosaurus, sometimes referred to as the “Lion of the Jurassic”. The hunting behaviour of this iconic Theropod is explored and the author suggests that Allosaurus hatchlings probably fed on insects before moving on to vertebrates. Evidence for Allosaurus/prey interaction is presented and the theory that Allosaurus used its jaws like an axe to overcome its victims is explained. Allosaurus attacks! How did it hunt? What with information about new prehistoric animal models, fossil discoveries, classified advertisements and reviews of books related to palaeontology, there is certainly a lot going on inside the latest edition. Look out also for a review of Tracy Lee Ford’s and Mike Frederick’s book “What Colour were Prehistoric Mammals?” which also features in this jam-packed publication. Team members have been reliably informed that the next edition of the amazing “Prehistoric Times” magazine is in the post and heading towards our offices. The next issue (autumn 2018, or as our American friends would say fall 2018), will be with us in a few days. The powerful, Late Cretaceous predator of the Indian sub-continent Rajasaurus features on the front cover. Rajasaurus (R. narmadensis) was formally named and described in 2003. It is a member of the enigmatic and bizarre abelisaurids and we look forward to reading more about this large carnivore in the forthcoming edition of “Prehistoric Times”. Specifically, we hope to learn more about any thoughts on niche partitioning between Rajasaurus and the contemporary Indosuchus, another large abelisaurid that co-existed with “princely lizard”. Probably an apex predator in its environment – but how did it interact with Indosuchus? One of the must see films of last summer was “Meg” starring Jason Statham and a population of giant prehistoric sharks. The author of the novel on which the film was based, Steve Alten, is interviewed and we can look forward to hearing more about the marine reptiles that inspired the artwork of the famous Czech illustrator and palaeoartist Zdeněk Burian. In issue 127, New Zealander John Lavas, provides part 10 of his long running series, this time the focus is on Burian’s depiction of plesiosaurs and pliosaurs (Plesiosauria). “Prehistoric Times” is published four times a year and it has built up a strong reputation for its superb articles, illustrations and reader submitted artwork. It is highly regarded by many dinosaur fans and model collectors from all over the world. The autumn edition of “Prehistoric Times” will also feature the “shovel-tusked” member of the Proboscidea – Platybelodon. We look forward to Phil Hore’s article on this distant relative to extant elephants. For much of the 20th Century, most palaeontologists thought that Platybelodon lived in swamps, but analysis of tooth wear patterns suggested that this sizeable beast fed on tough, coarse vegetation. It is now thought that Platybelodon was an animal of relatively open, grassland and scrubland environments. We shall have to wait for the arrival of the magazine to find out the latest information and scientific evidence.